Living in a small apartment in the city has some major perks, but entertaining can be tough when you only have a few square feet to spare. A typical Saturday at our apartment looks like this: sitting on the floor around the coffee table tossing game dice with six other people. Sometimes we pull together all of the chairs we can find (and chairs that friends bring) and squeeze to fit around our dining table. Most of us hold our drinks because there’s no table space available thanks to the extensive board games we like to play. We have one of the largest apartments in our group of friends (650 square feet), so we’re most often the gathering place. For as fun as it can be, it can get overwhelming. So how do you keep it simple when it comes to entertainment outside the apartment? My husband and I love our evenings together in the apartment. But, since I work from home all week and don’t usually have access to the car, I need to get out at least once or twice during the weekends. Staying in is cheaper, yes, but when you’re living in a large city there’s so many opportunities for unique and interesting entertainment. It makes “keeping it simple” a little bit difficult, but by defining what you really want in advance and creating a solid plan, you can expand your horizons without the overwhelm. And that’s why it’s not always best to stay in: getting out and seeing different things gives me new ideas and fresh eyes. 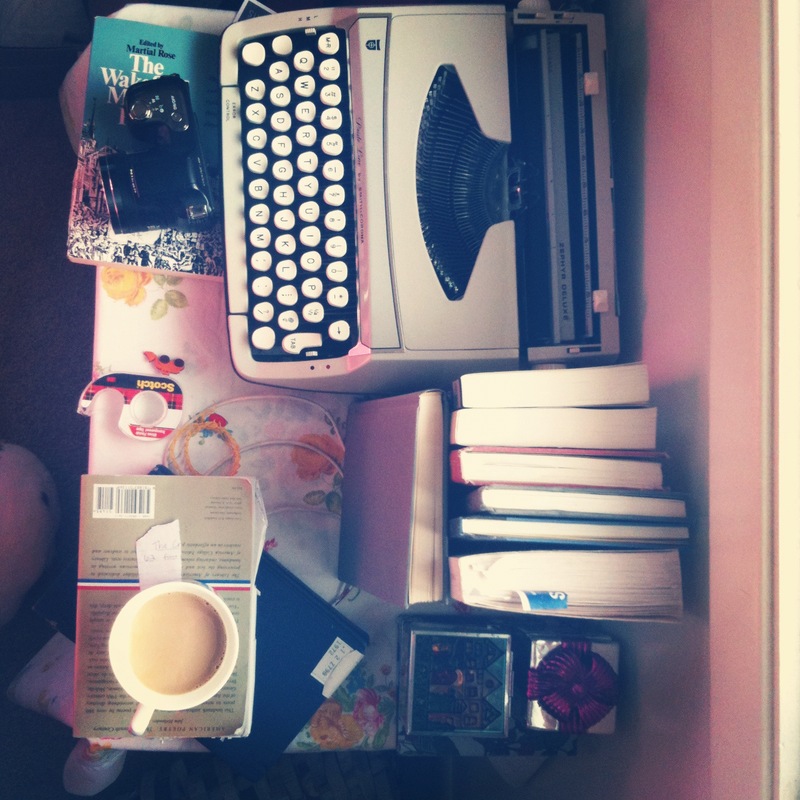 It’s a great way to kickstart a sluggish creative muscle. I’m a big proponent of planning. Even if I don’t follow the plan to the letter, it always gives me clarity and direction for the week. So start by defining clearly what you enjoy doing and what you expect from entertainment. For me, physical activity, chatting with new people and trying new beverages in interesting places are important parts of entertainment. You might like quiet spaces, ear-bursting concerts, historical education, cultural immersion, getting out of town or staying close to home. Then, considering your budget, put together a list of general things that meet those expectations that you can reasonably do most weekends or in your spare time. Mine would be hiking, checking out coffee shops or bars, or taking a class or going to a meetup of sorts. Then fill in the spaces! If you like hiking, spend some time each week finding a new place to hike. I scour Yelp for popular bars or cafes and plan a happy hour when I can to save a few bucks. Planning what, when, and where you are going to do in advance adds a little structure and prevents drastic impulse decisions, last-minute planning stress or defaulting to something like shopping for the sake of shopping. If you’re the outdoorsy type, check out All Trails and look for good hikes in your area. I’ve been using Hiking Guy, but he’s only got a limited area of coverage. Google is your friend here – keep an eye out for tips on getting to trailheads, parking, what supplies to bring, and difficulty level. If you’re gastronomically inclined, Yelp is the obvious choice. I’ve found that since moving to the city, there are a LOT more reviews, which makes the average rating a little more accurate. I was used to seeing 10 reviews for places in Indiana, compared to hundreds or thousands here. Where the F*** Should I Go to Eat? is a fun website when you’re feeling stuck. Once you find a restaurant or cafe you like, check out their events calendar online for open mics, concerts or happy hours. Bar entertainment is usually cheap and more intimate than a giant concert venue. And if you’re lucky enough to have comedy schools available (I’m looking at you, LA, Chicago and NYC), check out student teams and professional comedy groups. Stand-up and improv comedy can be inexpensive if you know where to look! The Groundlings, Second City and Upright Citizens Brigade are great places to look for solid evenings of entertainment. I hope a few of those ideas strike a chord with you! What is your favorite way to stay entertained without all the overwhelm? While we’re on the subject, you should check out my husband’s newest YouTube sketch that he wrote and performed for his comedy group The Swing Shift. They’re such a talented group of people who I have the pleasure of calling my friends. Victor (my husband) is pursuing his passion for comedy as a student at The Groundlings School! Don’t wish away your time. 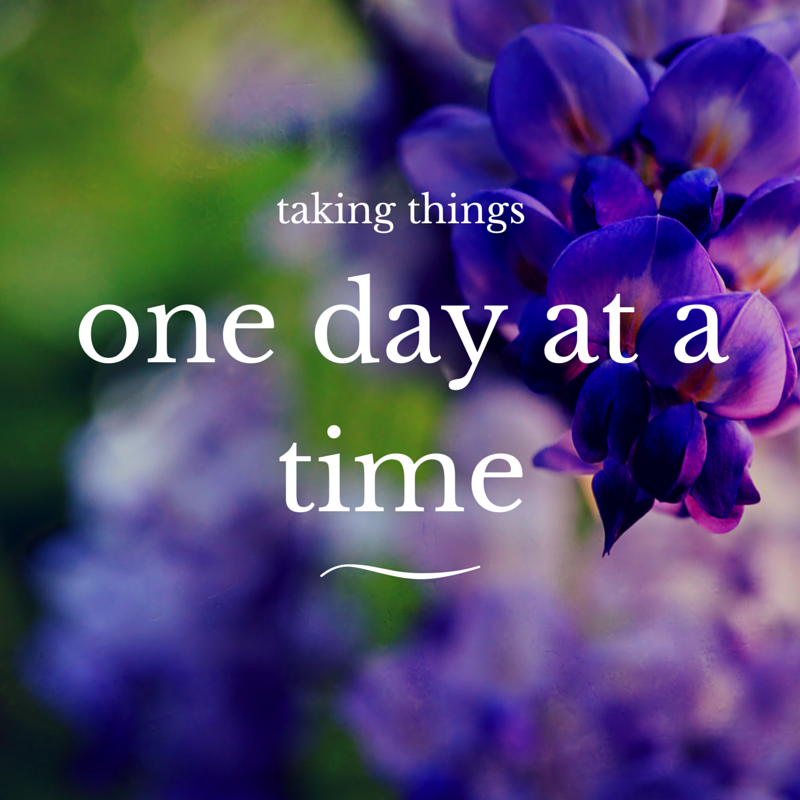 Take everything one day at a time. The stubborn part of me always snickers at these cliche bits of advice, but since I’ve started working entirely at home and on my own terms (and having time for more hobbies), I’ve been taking these more seriously. And, if you’re anything like me you probably understand this desire to do all the things, and the feeling of failure when all of the things don’t get done. (Also, clearly this is not my actual to-do list, but it is a good representation of how I like to overschedule myself). Our standards, while sometimes helpful, can often be our downfall. It’s time to grab that cliche advice in our hands and read it, recite it, hug it dearly until we understand it. One day at a time. Isn’t that the truth? However, we’re constantly presented with people and stories that seem to be just that – it’s like they woke up and were suddenly more awesome than they ever dreamed they could be. I have to be honest with myself: I can’t go out and run a marathon tomorrow. It’s all in our head. It’s a mental thing! Nothing more. Starting from there, you can start to readjust your expectations and mold them to fit a more agreeable and achievable reality. I’m not saying to settle for less – I’m saying to avoid frustration and burnout, you need to set reasonable expectations for your progress. It’s not easy. So, instead of the above to-do list, I’ve been focusing on making things a little more tame. For example, I’m nearing my two-week mark of running (or other similar activity) every day. My old high school successes in cross country (that came to a painful end with hip fracture and surgery) have been coming back to haunt me lately, so I decided to get back in the game. Am I running 7-minute miles and knocking out 5k’s like they’re nothing? Hell. No. I want this to be a lasting habit, so my goal each day is a leisurely 1 mile run around my apartment complex and a bit of walking. Some days I feel like I could run for hours, and some days even half a mile is painful, but I always make sure to get just 1 mile and train my mind to think of running shoes as an everyday accessory. It’s time we all slow down a bit and allow for a bit of sanity. I’ve already started with the running habit, but can I make the rest of these habits as well? Yes. Yes I can. It’s never too late to pursue one of those high-level goals (like becoming a marathoner), but they require small steps at first. What’s more, they require any steps at all – getting started can be one of the biggest challenges (and there, my friends, is another true cliche for you). As for the rest of my evening, I have one more work goal to meet and then I’ll happily fall asleep and rest up – tomorrow’s a brand new day. Any tips you have for slowing things down and getting more done? Last week, while I was staying with my family and finalizing wedding plans, I received a heartbreaking phone call from my fiance: our little deaf rabbit, Niels, had passed away in the night. My heart sank to my stomach as I heard about how peaceful he looked in the morning, and how unexpected this had been – my fiance hadn’t noticed any difference in his behavior over the weekend, and Niels had certainly not indicated that he was having any troubles before then. 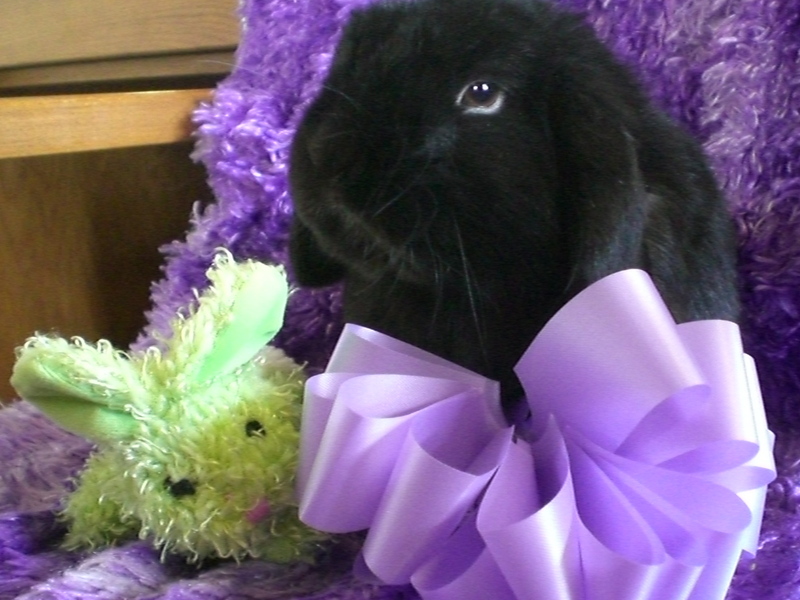 He’d always been a sickly rabbit (he was deaf and had recovered from a broken back), but he was a happy rabbit. He ate well and loved to snuggle with his “husbun” Rorschach after long days they spent exploring outside of their cage. So while it was unexpected, it made sense. But it didn’t make it any easier. Niels, celebrating his first Easter four years ago. When I drove back home the next day, I resolved to see Niels one last time. My fiance had put him in a shoebox so that we could bury him back on my parent’s land, and I needed to see his beautiful black fur. When I saw him and reached out to touch him, I realized that it wasn’t actually the still and silent body in front of me that I had loved. It was the life he had, the life he brought to our little family every day, that I most loved and will most miss. But when I saw his tiny body, I knew that it was time to send it off – just like the other possessions I’ve been slowly passing on through my life. The memories and happiness that his life brought me still remain, and the hole I thought he would permanently leave has already started to fill up with help from my other rabbit, my fiance, and my dear friends. I look back at pictures fondly, knowing that Niels was my little source of consistency through a period of great changes in my life. I miss the little guy, but I feel I’ve come away from this sadness with a heart full of gratitude for the nearly five years he was with me, lighting up my darkest days with the rare, pure joy that sometimes only pets can bring. It was a reminder to always pay attention to the littlest and simplest things, even when there are loud, big distractions trying to disconnect you from them. It was a reminder to always say a fond goodbye to your loved ones, even if you’re only gone a day. And even if they’re rabbits. Earlier this week, I was mentioned on a list on the blog Be More With Less, and ever since then, I’ve experienced massive amounts of traffic to my blog. What I’ve most enjoyed about this is that I’ve received many comments on posts that are incredibly encouraging and I just wanted to say thank you! I hope that I can continue to inspire and excited people about simplifying their lives – it’s something I am so passionate about. That being said, I want to reflect on kindness. Kindness is an essential element of living a happy life. Not only does it help us be happy people, but it also helps deepen relationships, improve our health, and even lengthen our lifespan. 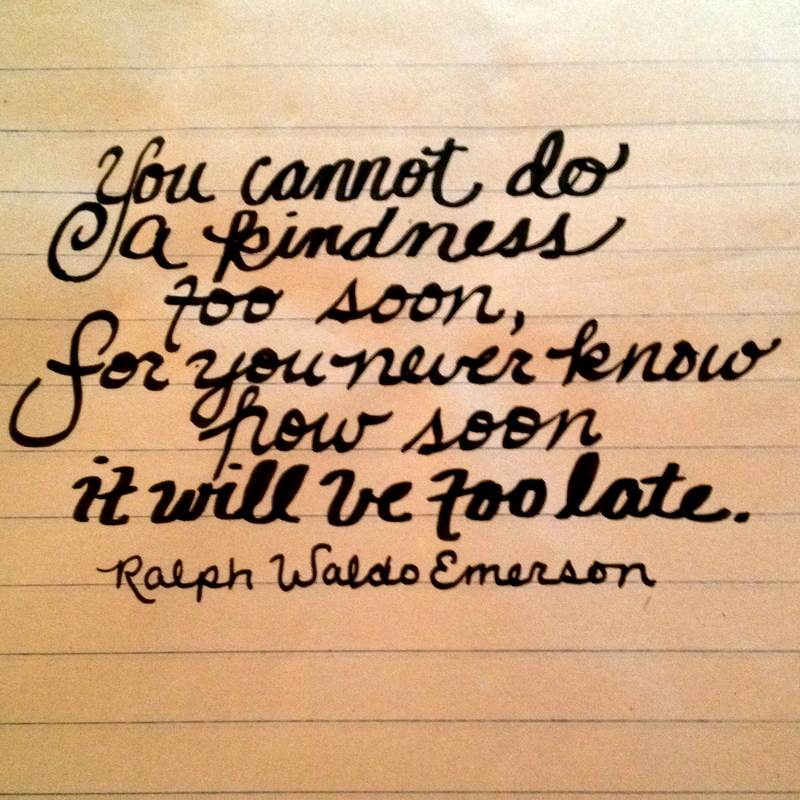 In the age of the internet and anonymity, it seems that kindness is fading away. However, as I delve further into these simple living and minimalist communities, I find that there’s an abundance of kindness and gratitude floating around. And it’s not because we own nothing that we are turning to kindness. It’s because we’re developing a stronger awareness of what we do own, and how we own it. Kindness doesn’t always have to be random and target a stranger. It’s one of the most inexpensive and effective ways to make a permanent impression upon someone’s life. Most of us know about these “tricks” already, but why don’t we start incorporating them more regularly? Say I love you to a parent, friend, or significant other when saying goodbye on the telephone. I would say that 1 in 7 or 8 conversations I have end this way. Why can’t more? Say good morning – and mean it. Don’t groggily say good morning and proceed to complain about how you haven’t had your coffee yet. Learning to be kind when you’re too tired to function is a difficult, yet rewarding, skill. Next time you disagree with a partner about a meal, a movie, an activity, or something rather insignificant, hand over the choice to them. Be gracious and don’t pout; the more they see you exhibiting this behavior, the more apt they’ll be to return the favor. Clean up after yourself. I’m guilty of this – I tend to leave my dishes out, my clothes on the floor instead of the hamper, and my few cosmetics lying out on the bathroom counter. While I compensate by scouring the apartment about once a week, this is still something I could do without being told that my fiancé would greatly appreciate. Offer to help, in any way you can. Be genuine about this, and be honest with the person you are offering to help. Maybe you can help by cooking a meal for them, cleaning their home, or if you can’t be there to help physically, maybe you can send a few words of encouragement via snail mail. Be reliable, and you’ll reap the rewards of a loyal and strengthened relationship. Of course, being kind isn’t always about the rewards. Be kind without seeking reward. Challenge yourself to being kind unconditionally. I’ve been stuck in a rut lately. Wake, exercise, work, eat, sleep. I’ve been fairly removed from anything else. Occasionally I’ll read a chapter or so of a book that I’ve been meaning to read, and sometimes I’ll toss in a trip to the grocery store, but that’s pretty much my routine. There’s nothing wrong with routines, in fact I think they have enormous potential to make us more productive and creative. Scheduling time to pursue our creative endeavors can allow us the freedom to truly express ourselves. But what happens when there’s not enough hours in a day to schedule our creative time? For me, writing this blog is something that I try to pencil in as often as I can, but other obligations override it: more work, trying to keep up with my exercise routine, playing with my rabbits, sleeping. I’m working on getting out of this rut and getting back into a well-rounded schedule and these are the activities and exercises I’m going to try. Taking ten minutes a day to truly do nothing. The idea of meditation intimidates me, but when it’s rephrased as simply “doing nothing” and observing my thoughts, I’m more inclined to try it. I haven’t yet sat down to do this, but I’m looking forward to seeing how well I handle sitting still for that long. As soon as I find myself in a rut, I’ll get up and take a walk. This morning, I found myself completely unmotivated, so I put on one of my signature pump up songs and hopped on my stationary bike for five minutes. Last night, I was getting tired as I was chipping away at some work on my computer, so I dropped everything and went for a ten minute walk. My usually racing mind appreciates this time to just focus on physical activity instead of brain-draining tasks. Accomplish something smaller. This morning, after attempting to motivate myself, I didn’t start right in to my to do list. I washed my dishes and then cut up a bunch of plastic bags and made them into a bouquet. I felt accomplished (and a bit ridiculous), and I was then able to make myself some coffee and jump in with this blog post. Starting off by accomplishing smaller tasks makes me feel more prepared to tackle larger ones. Create a real (or even imagine) community that depends upon your progress. My goal is to run a mini-marathon with my mother in the fall. Honestly, that might not happen, but she’s able to check in on me and encourage me to continue running. When I think about blogging, I find myself noting that I have a few followers, and that they may be looking forward to my next posts. I have friends who ask about my blog. Creating this sense of responsibility may be limiting to some, but I personally am motivated by being held accountable for things I say I’m going to do. So what do you do when you’re stuck in a rut? Do you have a spare hour today? Block it out. You’re going on vacation. But how? 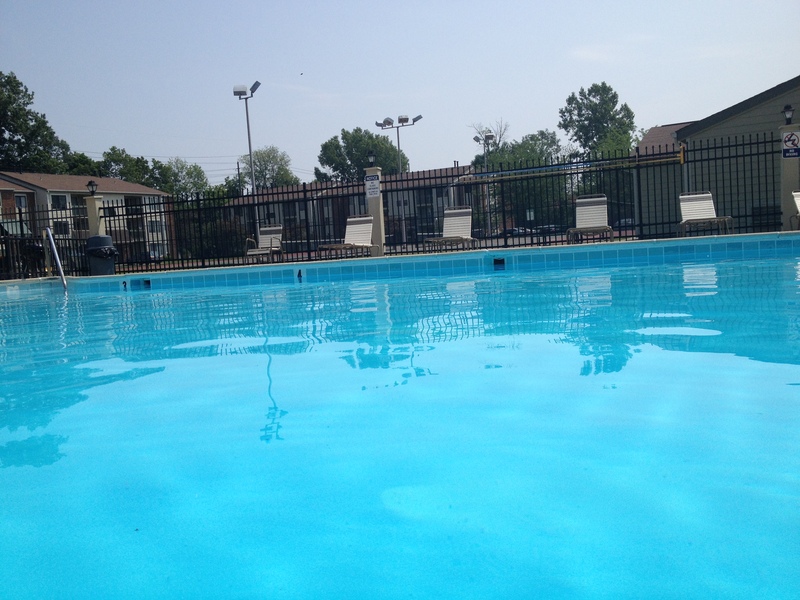 Check this out: I’m writing this post while making waves with my feet in a dreamy blue pool. I’m wearing an absurdly happy summer dress and soaking up some sun in 70-something degree weather. I am one block away from my apartment. Avoid computers–they’re too distracting. Let your mind wander freely, but when it wanders towards to-do lists and work stresses, refocus it on things you wouldn’t normally notice. The smell of the air surrounding you. The sun or breeze on your arms. The silence of your phone. I recently read this post on incorporating this vacation mindset into your everyday life, and can say I’m excited to try it. This will all get more difficult once winter sets in, but hopefully we’ll all have these positive habits ingrained well enough in our lives by then that they’ll be easy to maintain. 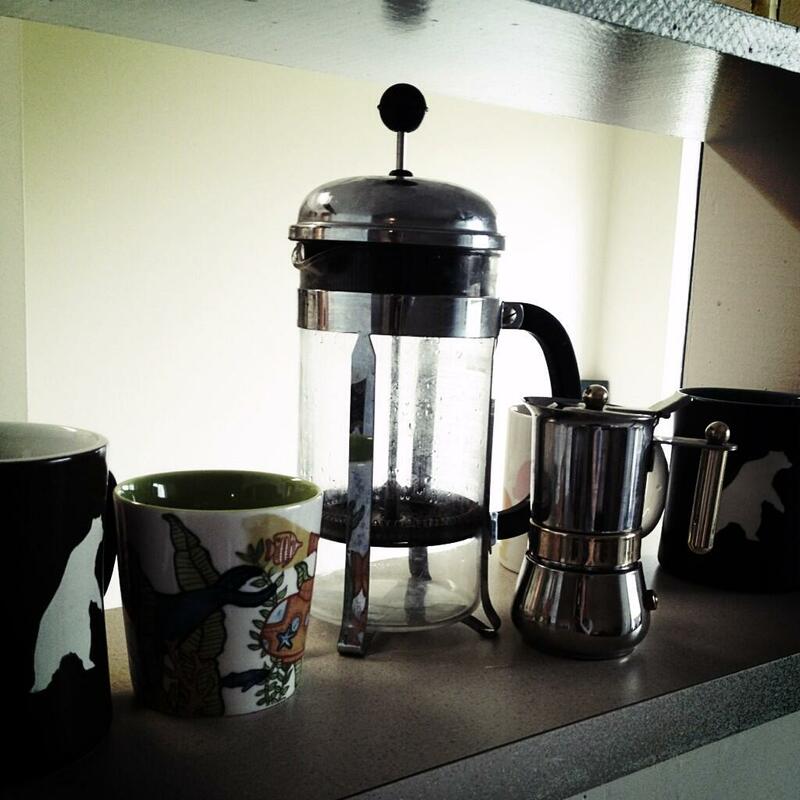 My french press and the newest addition to my coffeemaking family, my little silver moka pot. About a year ago, I decided that I no longer needed my autodrip coffeemaker. Now, to put this decision into perspective, I had previously made a large pot of coffee at least once a day. Very often, I’d put on two or more pots a day, and my roommate and I would fill our coffee mugs to the brim with flavored creamer and coffee and fuel up. It was one of the best choices I have ever made. Not only can you brew a mighty fine (and strong) cup of joe with a french press, but it reconnects you to the process of making something for yourself. I find that as I boil the water on the stove, grind the beans, and time out the brewing just right, I slow things down and making coffee becomes a purposeful task. What in the world does this mean to me? Sorry if I gushed just a little bit too much about coffee. But, there’s a valuable lesson here that I’ve begun applying to other areas of my life. Slow down, and quit taking the path of least resistance. Our modern lives make it easy to remove ourselves from small daily processes that make us feel capable and productive. Heavy reliance on pre-made meals fall in that category–if we can’t make our own food, what can we do for ourselves? Buying cleaning products when plain baking soda and vinegar will do the trick most of the time. Driving our car instead of biking short distances. Take some time and consider what you can start doing manually in your life. Don’t become a slave to convenience.